We all know that growing our own food offers multiple benefits—for our health, our taste buds, and our pocketbook. But how many of us know how much we’re actually saving? For the past few summers, I’ve conducted a little experiment to see just how much I would save by growing veggies myself versus buying their supermarket counterparts. You may be surprised at the results! Personal satisfaction: When it comes to self-sufficiency, there is nothing more elemental than being able to feed oneself. I love the early-evening ritual of wandering down to the vegetable garden, colander in hand, to pick whatever’s ripened and prepare it for my dinner that same evening. Lessening your environmental footprint: By reducing your reliance on foods grown far away and trucked hundreds or thousands of miles to your local grocery store, your food consumption contributes less to smog and global warming. By growing your vegetables, you’re also doing your part to reverse the globalization of the food supply. Superior taste and freshness: Homegrown fruits and vegetables simply taste better than produce that’s been allowed to ripen in trucks during transport and sit on store shelves before you’re ready to eat it. Even if you’re not a verifiable foodie, the taste, flavor, and freshness of homegrown produce is reason enough for many gardeners to devote a portion of their yard, patio, or terrace to growing vegetables. Better nutritional value: Because less time elapses between harvest and consumption (say, about an hour when I harvest my own produce compared to days or weeks when I buy it in the supermarket), homegrown vegetables deliver higher nutritional value. And if you choose to grow your produce pesticide-free like I do, you’ll get the added health benefits of consuming organic produce at little-to-no extra cost. The ability to reduce your grocery expenses: In today’s challenging economy, nearly every consumer is looking to save a few dollars wherever they can. 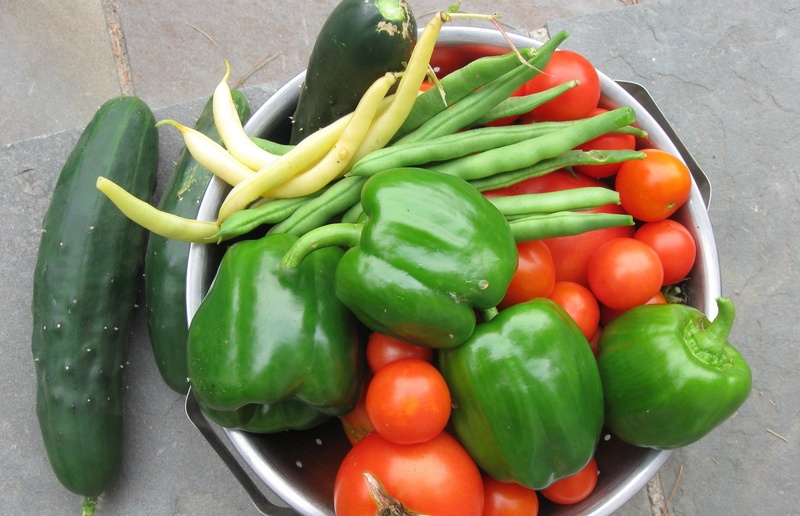 Growing your own vegetables can substantially reduce your grocery bill throughout the summer. If you freeze or can your surplus, you can extend your savings into the winter months. This is the third season I’ve tracked my garden’s output, not only by the pound, but by its monetary value. My garden plot is modest in size, about 120 square feet. It was not intended to feed a large family, although the inevitable surplus is freely given to friends and neighbors. In its current form, it’s L-shaped (to detour around a small juneberry tree) and located in my front yard, to take maximum advantage of sunlight. Die-hard gardeners can spend lots of time experimenting with heirloom varieties, growing plants from seed, and researching the best soil amendments, fertilizers, compost, and mulch covers. Yet you can fumble along, make mistakes, and still wind up with a respectable harvest, provided there’s ample sunlight and adequate watering. Due to my own laissez-faire attitude about plant diseases, my garden is succumbing a few weeks early to blight and powdery mildew. With the harvest about 95 percent in, I’ve tallied up my pickings for the season. To determine their monetary value, I checked the prices of comparable produce at Shop Rite, my grocery store of choice. Whenever possible, I used prices of Shop Rite’s organic produce. But for about half of what I harvested, I couldn’t find organic equivalents and was forced to use the non-organic price in my comparison. Because produce prices fluctuate regularly, I used an average of Shop Rite prices I found throughout July and August, at the height of my garden’s production. How do these numbers compare to previous years? In 2009, I grossed $148 in produce from a somewhat smaller-sized garden, but ended up with -$222 after factoring in my ‘start-up’ expenses which included a pricey, six-foot-high roll of wire fencing and metal posts (essential to exclude deer). Last summer, I hand-picked 39 cups of wineberries, which really boosted my ‘garden’ productivity. I planned to do the same this summer, but lost my enthusiasm after finding a tiny tick embedded in the skin between my fingers. I don hip boots sprayed with DEET for wading into the brambles as protection against ticks (I’ve had Lyme disease twice) but hadn’t counted on picking one up on my hand. So I settled for about nine cups of berries picked from the relative safety of the periphery of the thickets. This year’s garden is pretty much spent, but I take comfort knowing I’ll be enjoying my tomatoes, wineberries, kale, basil, and zucchini (in the form of soups, stews and quick breads, and on my breakfast cereal) in the cold winter months to come. I can’t wait until next spring, when I’ll be planting soybeans for the first time. Guest blogger Dawn Handschuh is a freelance writer living in Connecticut.